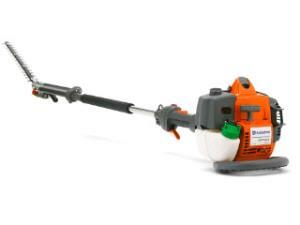 The extended reach gas pole hedge trimmer has an articulating cutter bar and can reach approximately 10'. The pole does not extend. The machine is versatile enough to cut both tall hedges and ground cover, and the cutter head can be positioned along the length of the shaft for easy storage and transport. A can of 2 cycle fuel mix is given with each rental. * Please call us for any questions on our hedge trimmer gas pole rentals in Hillsdale and Ridgewood NJ.